​Garrett, a Professor in Actuarial Science at Stellenbosch University, has been visually impaired since age 10 and started playing golf at the age of 15. Garrett was one of the founder members of the South African Blind Golf Association, and has served as their Honorary Secretary/Treasurer for several years. He has also been a member of the IBGA Board of Directors since 2012. Garrett, a member of the Stellenbosch Golf Club, has won the South African visually impaired title on a number of occasions. He also won the B2 World Championship in 2014, and was a member of the Rest-of-the-World Vision Cup teams of 2013 & 2015. Garrett is proud to have been selected to captain the side and 2017 and hopes the team can perform well on foreign territory this year. Garrett will be guided by Erich Kliem (from the Stellenbosch Golf Club). Erich also guided Garrett in the last Vision Cup in Italy and in the World Championships in Japan. Have been a member Royal Ashdown Forest GC. for nearly thirty years. I had the honour of being elected Club Captain in 2014. I continue to represent the club in many matches. James, my son and guide has just started playing golf, is also a member of Ashdown. he successfully guided me last year in the British Open. Member of EWBG for nine years. Represented EWBG eight times in our annual international against Scotland. Some of my international successes. 2015 ISPS Vision Cup. vice captain of successful Rest of World team against NA in Italy. 2014 won ISPS Handa British Open in Northern Ireland. 2014 won B3 ISPS Handa Italian Open. 2013 vice captain of Rest of World team in first Vision Cup, held in Columbus GA. RoW team by half a point. 2011 won ISPS Handa British Open in Norther Ireland. "Hi! I'm Mr. Dong-sik Im, nice to meet you. I live with wife in Seoul, Korea & the Chairman of KBGA & vice-chairman of Korean Differently Able People Golf Association now. My job is a Massager & I'm a professional musician, specially in piano. If you have any chance, please come anytime & let's have a drink togather. Zohar Sharon, aged 64, is married and the father of three children. He studied at the AVNI Institute of Art and Design, where he developed a special painting technique. He is also a registered physiotherapist. Zohar served as a sniper in the Paratroopers Brigade and lost his sight during his service at the age of 23. Despite the fact that he lost his eyesight over 40 years ago, Zohar developed a remarkable ability on the greens of fairways of local courses. He took up the sport 20 years ago. Initially, it took him almost three months just to hit the ball. Once he had mastered striking the ball, he continued practicing until he reached his potential- he can now complete a full 18 hole and boasts a 35 handicap. In July 2005 Sharon won the Caesarea Golf Club's Level Three Tournament for individual players and a month later, together with sighted golfer Asher Siso, he came in first place at the Level Three Israeli pairs' championship. In both competitions Sharon beat a large group of non-disabled, seeing golfers. He holds the title of World Blind Golf Champion for the years 2004, 2008, 2010, 2012, 2014 and 2016. He also came in first place in many British Open and European tournaments for Blind Golfers. Zohar is a member of the Zahal Disabled Veterans Organization and a Goodwill Ambassador on its behalf in Exhibition Games and Tournaments around the world.
" I am Mr. Jeong-il Yoo, Hi! everybody! Live with my family in Kyongki-provience, Korea. I'm a executive director of KBGA/KDPGA & my job is a massager. I am a power golfer, so I'm here to get trophy of B1. Please keep watching out for me. sight impairment. I joined England & Wales Blind Golf between 1998 to 2002 and had some great experiences including being England Captain in 2002. Back in 2002 I was playing off a handicap of 11 in b2 before giving the game up for 10 years. I started my own business which provides business development to companies in the construction industry in the U.K., this allows me to work from anywhere around the world and enabled me to come back playing blind golf again. I started playing again in 2012 following friends in blind golf constantly trying to get me back playing and started back with my wife Mel guiding for me. We met in one of my last blind golf events at Wentworth in 2002. Since returning we have both enjoyed some great experiences including having the honour of playing in the last match between both teams. I am a member of West Hove Golf club in West Sussex England, where I practice with my best mate and fellow team member Billy McAllister and Sandy McAllister We both compete in sighted club comps and partner each other in club knockouts. I am coached by Ryan Fenwick at West Hove and have been working together over the past year. In all the time I have played blind golf I have found the b1s truely inspiring. Both me and Mel feel honoured to be part of our team and look forward to being part of a great event and making new friends from around the world of blind golf. During our first trip to Canada. Australian Golf Champs - 36 Holes Nedlands Golf Club & Collier Park - Gross Runner Up. England Captain and Team Member. In Chan Cho was born in 1953 in Seoul, Korea, just after Korean War. 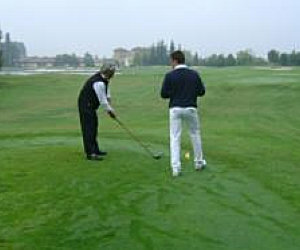 He was a businessman and had played golf since he was young until he lost his eyesight. In 1988, He got Age-related macular degeneration (AMD). After 6months, he lost his eyesight of right eye. He stopped playing golf on February, 2000, when he got AMD in left eye. In 2005, he lost most eyesight of left eye, too. However, he restarted playing golf and joined KBGA in 2007. He has wife, and a daughter and twin sons, and a grandson and two granddaughters. especially for vision impaired visitors since 2011. Stephen Mitchell started playing golf in 1996 I have won the Australian Open five times the Victorian open five times New South Wales open 4times & Western Australian open and many more local tournaments. Japan open in 2002 and the current, Queensland Open champion, arthritis is starting to slow me down, still enjoy meeting old friends and new ones. Cameron was diagnosed with Bilateral Retino Blastoma at just 18 months old, he had his left eye removed but fortunately a small part of vision was saved in the right eye. Cameron was introduced to golf at an early age spending summer days in North Berwick with his Nana and Papa on the putting greens. As a teenager Cameron's Dad and guide Jim introduced him to the rest of the game. Together they have been members of the Scottish Blind Golf Society ( SBGS ) since 2003. Cameron has had a very successful golfing career thus far. Almost all of his success he would credit to do his Dad and former European Tour Professional Colin Brooks who has coached Cameron from the very beginning. Cameron is part of the Golf Team working out of Dalmahoy Hotel and Country Club. This year Cameron has started working more with Professional golfer Scott Dixon, assisting him with coaching. Later on in the year Cameron will be put through PGA coaching training. Cameron has two golfing highlights he considers to be the best in his 13 years in blind golf. The first is having his Mum present as he won his second ISPS Handa British Blind Open. The second was the time spent in Japan with his dad last year for the ISPS Handa Japanese Open and ISPS Handa World Championships. When I found out I had been selected for the RoW Vision Cup team I was surprised and really pleased, on finding the event was in Canada a few hours from Calgary, I was absolutely thrilled. My last trip to Canada was in 1998 when I represented England at Volleyball in the World Police and Fire Games in Calgary, I still remember walking out with the England team at the opening ceremony in front of 30,000 people at the McMahon Stadium, a pretty amazing experience. It got better as we beat Calgary Police in front of a large partisan crowd in one of Calgary’s sports arenas. We eventually lost a team of giant Firefighters from Russia, however, I have fantastic memories of Canada and cannot wait for July. Before losing my sight I played most sports, whilst serving in the Royal Air Force I boxed and played rugby at national level. I played combined services Football and Cricket whilst serving in the South Atlantic and Belize, Central America. I represented England at Volleyball in the 1996 World Police and Fire Games in Melbourne and again in 1998 in Calgary. I also played in a few European Beach Volleyball events in the early days of the sport, wet and windy English beaches are a far cry from the sport today. My first real venture into golf was about 8 years ago after watching the Disabled British Open on TV and I saw our RoW Vice Captain, John Eakin competing………. After searching google and a few emails later, I started playing disabled golf. I met one of our team menber’s, Billy McAllister at a Pro Am during the Seniors British Masters in Manchester and subsequently joined blind golf where I have played for 3 years. So far in disabled golf I have had wins at the Czech Disabled Masters, the Northers Disabled Open, 4 wins at Scottish Disabled order of merit events, a second place at the British National Championships and a 5th place at the Turkish Disabled Open. During my 3 years with Blind golf I have won the Chairmans Cup, Lawrence Levy British Blind masters, I finished 2nd the following year, and had 2nd and 3rd place finishes at the British Blind Open, I also finished 3rd in the B3 category at the recent Blind World Championships in Japan. When I started losing my sight about 12 years ago, I thought my days competing in various sports had also gone. Thanks to Blind golf I still compete and have been fortunate enough to meet some truly amazing and inspirational people, many of these people from both teams, I will meet up with again in July. I am counting down the days.